Just talking about dental visits will many times elicit a negative response from many people. In some cases, anxiety is associated with dental treatment. Many times, these feelings can stem from negative experiences in the past. Not only do we understand these reactions, but we work hard to change your perception of dental care. Dr. Gray will never lecture or scold you for not seeing a dentist in years, or for the condition of your mouth. You don’t have to worry about being embarrassed. We have seen it all. His average sedation patient has not had regular care for an average of 10-15 years. Like we said, We Understand, We Care, and best of all, We Can Help. Unlike the typical, stark feel of most dental offices, we have created a soothing, peaceful atmosphere, with your comfort and privacy being our utmost concern. From our Relaxation Dream Room (See Below) to our refreshment center, where drinks and snacks are provided for you. You may be surprised to feel, as many of our clients do, that a visit to the dental office can actually be enjoyable! We want you to not only love your new smile, but enjoy the process of getting there. Special custom Tempurpedic chair pads and neck pillows. A warm caring and attentive team to insure your every comfort is handled just the way that pleases you! A specially designed room just for your stress relief and comfort. 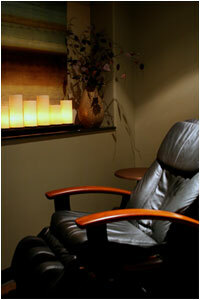 Come early or stay after your visit to decompress and enjoy a few minutes of tranquil relaxation. A specially designed massaging recliner will gently caress your body to a dreamlike state, while tranquil music soothes your mind. Even if you don’t have an appointment, you are welcome to drop by anytime and enjoy this room along with our refreshment and juice bar.